The Beantown Bloggery: Opening A Restaurant In Boston Common? There was a really interesting article this past weekend in the Globe about Boston officials and their goal to rejuvenate Boston Common. In an effort to get some ideas, they went to NYC and checked out some of the restaurants there that are located in or around NYC parks. Boston officials, marveling at the vibrant scenes they found in New York, said they are exploring the idea of establishing a full-scale restaurant, a simple food kiosk, or something in between to attract diners to the Common. 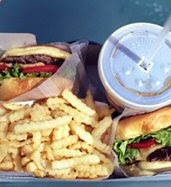 One of the restaurants they visited in NYC was Shake Shack (here). I've seen this place first hand, the line is literally always fifty people long. It's pretty amazing. I haven't eaten there yet, but I've heard it's quite good. I would love if they opened something along those lines in the Common. There's another place in Napa that also has a similar feel - called Taylor's Refresher (here). I ate there on my last vacation to CA. Again, the line was long and winding to get food. Just one thing for the Boston officials to be wary of if they decide to do this. And I don't know if Shake Shack causes this or if it's just a problem NYC has, but the rats in that area are gigantic. I hope they have a good garbage disposal plan developed as well. 1 Response to "Opening A Restaurant In Boston Common?" Central Park, at 843 acres, is 17 times larger than Boston Common (50 acres). Tavern on The Green is a 27,000 sq. ft. restaurant. If you scale that down by a factor of 17, so that the restaurant is proportionate to the size of Boston Common, you get a restaurant that is 1,588 square feet. That's roughly equivalent to a restaurant measuring 53 x 30. If you can make a restaurant that small viable, then perhaps the idea has some merit. But it doesn't make sense to have a bigger restaurant eating up our Common.